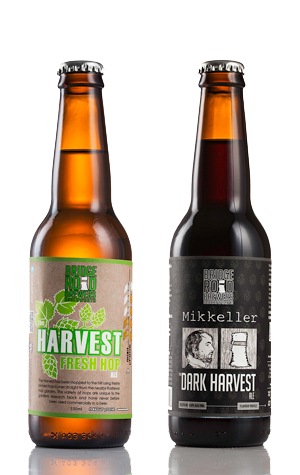 For the past few years, Bridge Road Brewers has been at the forefront of the push for greater recognition for Aussie hop varieties, particularly those developed by Hop Products Australia (HPA). Alongside its range of single hop IPAs, the brewery's annual harvest beers play a great role in introducing people to the flavours and aromas of varieties being grown in the Victorian High Country and Tasmania. Usually, they feature one or more as-yet-unreleased varieties. However, with the Rostrevor hop farm badly damaged by storms late last year and HPA losing 40 percent of its 2016 crop, a decision was taken to focus on saving as much of their popular commercial varieties at the expense of this year's research crop. So, for the Harvest Ale and Dark Harvest 2016, the brewers have instead used existing hops. The Harvest Ale features well known Galaxy and Ella, added in large quantities in wet hop form on the same day they were picked just down the road from the brewery. Yet, even though they're well known varieties, there are surprises to be found. The aroma is, as you might expect, monstrous, but rather than the hit of passionfruit one might expect, we found fresh pineapple at first and then tonnes of peach and melon, with a powerful, resinous bitterness completing the picture. As for the Dark Harvest, the beer we chose to feature as Bridge Road's representative in a new beer book coming out later this year, gone is the choc orange character that has been wowing people since the beer was first brewed overnight with Mikkeller. Instead, the hops – Ella and Vic Secret – contribute a more subtle tropical character as well as a fairly aggressive bitter finish, enhanced by the roast character of the dark malts.